The CRH380BL trains are now officially back in the black. 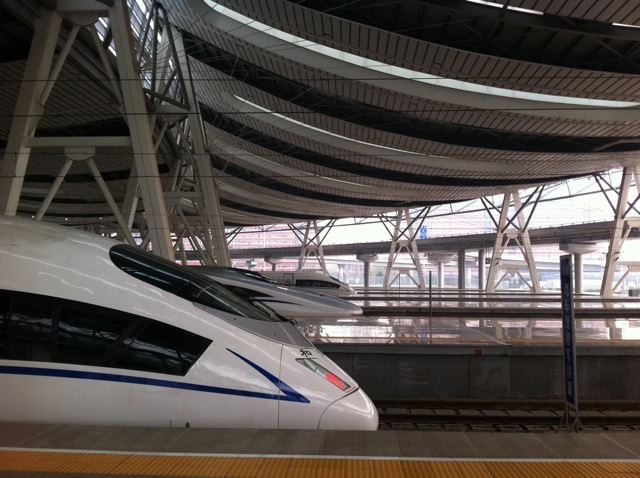 After resuming services on 16 November 2011 from Beijing South to Qingdao and back, these trains have started running on “main line” Beijing-Shanghai HSR routes and will re-enter full service shortly. The CRH380AL trains will then go in briefly for planned maintenance and will return after that. There is also news that the CRH380BL trainsets have resumed production. China is expected to have up to around 165 CRH380BL trainsets up and running. 15 former CRH380BL trainsets will become the newer CRH380CL trainsets, which are ready for the cold northeastern weather when the Harbin-Dalian HSR opens up in mid-2012. Presently, most CRH380BL trainsets serve the Beijing-Shanghai HSR, with a few connecting to Qingdao and to Hangzhou. They look like their German-ish CRH3C brethren, but are longer (16 cars instead of 8) and feature the much sought-after Business Class, as well as a full dining car. Previous story Beijing Subway Line 9: Is Fengtai Dongdajie Out Of Action?